Freddy and Hoppie go to school, but numbers are smooshed together, words blur, and the wrong answers make classmates snicker. After a week, Freddy knows it’s time to tell his mom what’s going on, but admitting you need help can be hard. 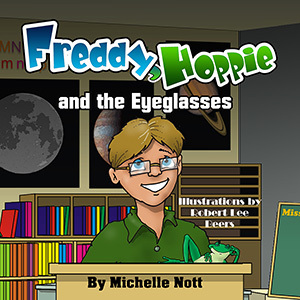 Freddy, Hoppie and the Eyeglasses by Michelle Nott is an adorable story about a young boy opening up to his mother about an ongoing problem with his eyes. His imaginary friend helps him, but at some point Freddy must work up the courage to share what he is dealing with so he can get better. This story will touch the heart and make it easier for young people who might be struggling with vision problems to open up and to have some idea of what to expect. The ending is so sweet. The story is made better by the colorful and fun artwork of Robert Lee Beers. From facial expressions, to background details, to that silly and cute little Hoppie frog, the illustrations are the perfect complement to a wonderful story. I look forward to more books from Michelle Nott soon.